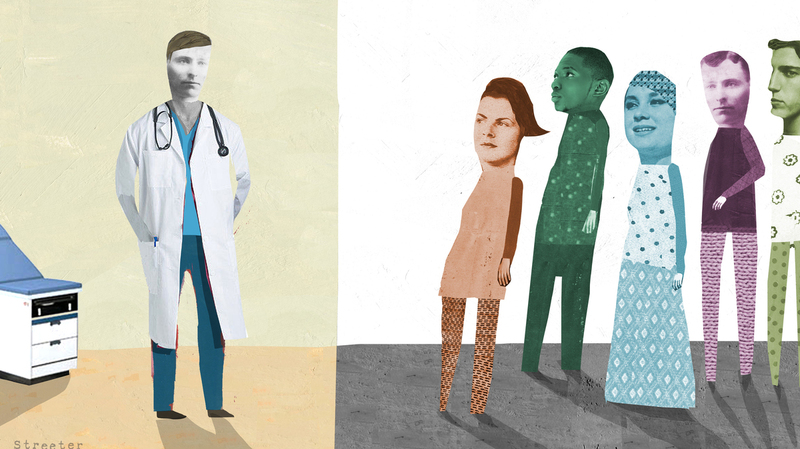 Can Health Care Be Cured Of Racial Bias? : Shots - Health News A growing body of research suggests that doctors' racial biases and other prejudices continue to affect the care patients received. Medical educators say self-awareness is an important first step. "But with our son, since he was so 'large and powerful,' they were worried he might injure the medical staff," Lazarre says. "So they had to keep sending him back under the anesthesia." "He wasn't the giant they were describing him as," Lazarre says. Lazarre is white. Her husband is black. Lazarre says there's no doubt in her mind that the medical team's fear of Khary was because of race. "I understood, certainly not for the first time, that my son — and my sons both — were viewed as being dangerous, being potentially frightening to people who were white," she says. She's also sure the surgeon didn't see it that way. "Like most white people, I don't think he was conscious of it at all," Lazarre says. She and her husband insisted on seeing Khary. They saw right away that he wasn't angry or violent. "He was scared," Lazarre says. She and her husband leaned over and whispered in Khary's ear: "'It's going to be OK, you can calm down.' And he began coming out of the anesthesia more normally." Lazarre first wrote about this experience in her book Beyond the Whiteness of Whiteness: Memoir of a White Mother of Black Sons. Though it's been years since Khary's surgery, Lazarre says there's still so much that hasn't changed. Even as the health of Americans has improved, the disparities in treatment and outcomes between white patients and black and Latino patients are almost as big as they were 50 years ago. A growing body of research suggests that doctors' unconscious behavior plays a role in these statistics, and the Institute of Medicine of the National Academy of Sciences has called for more studies looking at discrimination and prejudice in health care. For example, several studies show that African-American patients are often prescribed less pain medication than white patients with the same complaints. Black patients with chest pain are referred for advanced cardiac care less often than white patients with identical symptoms. Doctors, nurses and other health workers don't mean to treat people differently, says Howard Ross, founder of management consulting firm Cook Ross, who has worked with many groups on diversity issues. But all these professionals harbor stereotypes that they're not aware they have, he says. Everybody does. "This is normal human behavior," Ross says. "We can no more stop having bias than we can stop breathing." Unconscious bias often surfaces when we're multitasking or when we're stressed, research shows. It comes up in tense situations where we don't have time to think – which can happen frequently in a hospital. "You're dealing with people who are frightened, they're reactive," Ross says. "If you're doing triage in the emergency room, for example, you don't have time to sit back and contemplate, 'Why am I thinking about this?' You have to instantaneously react." Doctors are trained to think fast, and to be confident in their decisions. "There's almost a trained arrogance," Ross says. But some medical schools are now training budding physicians and other health professionals to be a bit more reflective — more alert to their own prejudice. Places like the University of Texas Medical School at Houston, the University of Massachusetts, and the University of California, San Francisco now include formal lessons on unconscious bias as part of the curriculum. At UCSF, all first year medical school students take a workshop led by Dr. Rene Salazar, who coaches other members of the medical team, too. "A lot of folks come to San Francisco thinking, 'Oh it's such an open-minded place, there are no biases here,' " he tells a class of newly arrived pharmacy residents. "That's not true. You're going to see this in every hospital. It's going to be an issue." What Salazar wants these students to talk about isn't other people's biases, but their own. And not just the biases they know they have. But the ones they don't know — or don't believe — they have. "Like it or not, all of us hold unconscious beliefs about various social and identity groups," he says. "Many times we think about bias and unconscious bias — they are incompatible with our conscious values, right?" Before the class, students were asked to take an implicit association test, a series of timed computer tests that measure unconscious attitudes around race, gender, age, weight and other categories. Salazar asks who wants to share their results. "Well, I can share with you my story," he says. When he took the test for the first time, it showed that he had a preference for whites — or a bias against African-Americans. Research shows that 75 percent of people who take the race test show an automatic preference for whites. "I was struck," he tells the students. "Particularly being in the health professions and wanting to serve diverse communities, to learn that I had these biases — it was a bit disheartening." "I grew up in south Texas — 99 percent Mexican-American. Mostly Latino. In my high school, we had one black student," he tells the pharmacy residents. "And so, up until age 18, you can imagine, a lot of my ideas — a lot of my attitudes, a lot of my beliefs — about folks who were black came from what? The media." A student named Amanda raises her hand. She asks that we not use her last name because she's afraid that what she learned about herself could harm her career. Amanda explains to the class that her parents made their way to the U.S. from Iran, and settled in Marin County, north of San Francisco. She took the version of the test that measures bias against Muslims, and another on light and dark skin tone. "I kind of went in thinking that these are two areas that I would probably not have a bias, and that's kind of why I chose them," she says. "It was like, actually, 'You're biased and you don't like brown people and you don't like Muslims,' " she says. "Which is interesting for me — because that's, kind of, the two things that I am." The UCSF curriculum is based on a training program designed by Howard Ross, the diversity consultant. He says he developed the new "unconscious bias" approach to sensitizing people to their own predjudices after realizing that the traditional diversity training he was doing in the '80s and '90s wasn't working. "People who seemed to have transformative responses to those [earlier] trainings, to have that kind of 'aha' moment — particularly people in the dominant group, [of] whites, men, heterosexuals — often, if you talk to them a month or two later, they actually felt quite wounded by the experience," Ross says. In some cases, he adds, participants seemed to become more defensive and hardened in their biases after those early trainings, not less prejudiced. A 2007 study described in the Harvard Business Review examined diversity training programs at more than 800 companies over 30 years, and the results underscore Ross's point. Overall, such programs seemed to do nothing to change people's prejudices or improve diversity. Instead, in some cases, they reinforced bias. "What happens is, ultimately, we feel bad about ourselves, or bad about the person that made us feel that way," Ross says. So rather than making people feel bad or awkward, Ross and Salazar say that, more than anything, they want people to accept that having biases is part of being human. "You know we all have them," Salazar tells his class in San Francisco. "It's important to pause for a second and normalize this. And be OK with this." Salazar emphasizes that unconscious bias can't be eliminated, but it can be managed. "So how do we address our bias? What do we do?" One student says, "Slow down." "Yeah," Salazar responds. "A trick that I use is that I pause before I walk in, take 10 seconds even, 15 seconds, just to try to clear your mind and go in with that clean slate." It's too early to know if these new types of trainings that explore unconscious bias are actually having any effect on what goes on in the exam room. Participants fill out evaluation forms after the class, and these anecdotal self-reports are often positive. But, so far, there have been no formal studies to measure if anything in patient care has actually changed. "What happens when that door closes? What happens in the interaction when I can't see the patient and the doctor talking?" Salazar says. "That's a little hard to capture." Still, UCSF is betting the technique will help. Salazar and other leaders believe the younger generation of health care providers could help shift medicine — by learning early how to keep their own biases in check.